The IWC is inserted in the landscape with minimal impact on the routes of the herds. 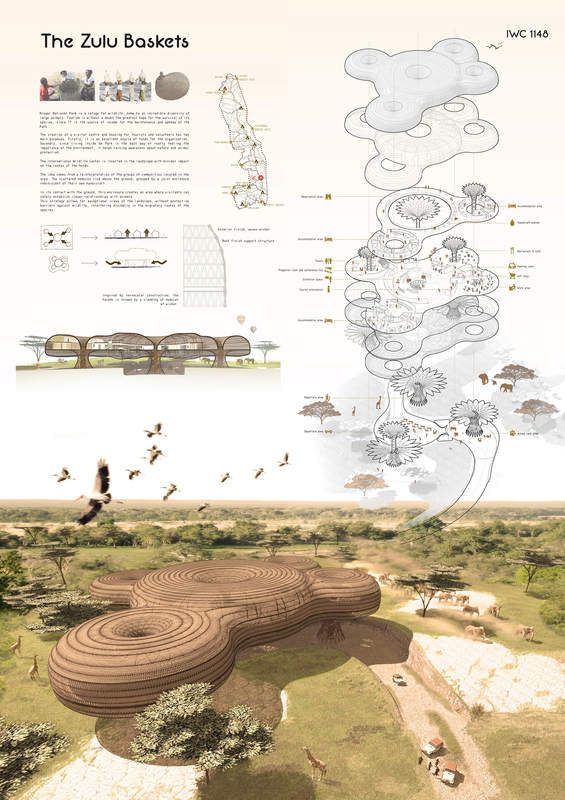 The idea comes from a reinterpretation of the groups of communities located in the area. The scattered modules rise above the ground, grouped by a joint enclosure reminiscent of their own handicraft. In its contact with the ground, this enclosure creates an area where visitants can safely establish closer relationships with animals. This strategy allows for exceptional views of the landscape, without protective barriers against wildlife, interfering minimally in the migratory routes of the species. Me encanta este proyecto, sigue y respeta el paisaje, casi difuminando con la estructura cual árbol de la sabana africana. Un aplauso grande para estos artistas. Que maravilla de proyecto, suerte!!! !